There’s so much written about what we should and shouldn’t eat to stay healthy. Sometimes it gets so confusing, people tell me they give up and just stick with what they are used to. The problem is, in order for foods to have a health benefit, they need to be consumed. So, you don’t have to buy an expensive juicer or spend top dollar on fancy drinks to be healthy, you just have to be “in the know”. Last year was the year of the juice cleanse. You couldn’t pick up a magazine or go onto the internet or even walk into a supermarket without reading or seeing the latest and greatest in juice cleansing. The ready-to-drink products may have had plenty of fruits and vegetables in them, but they also had an outrageously high sugar content which negated their so-called health benefits. I know someone who drank these liberally for many months and was ultimately informed by his doctor his blood glucose level was high. This man exercised daily and tried to make healthy choices. Lo and behold, drinking these sugar-filled juices became a problem for his health. The other major trend last year was the gluten free frenzy. People who did not have Celiac disease or a true gluten sensitivity were joining the craze. It is no longer true that you must go into a health food store to find gluten free products. They are completely mainstream now. This makes it easier for those truly afflicted to find appropriate food choices. However, for those who do not have a medical need to restrict gluten, they are paying the price for more expensive foods and possibly even some weight gain. The reason for the weight gain may be that gluten free foods are lower in fiber which is key to promoting satiety. So, unless there are more high fiber fruits and vegetables being eaten, gluten free is going to make you hungrier and propel you to eat more. So, what does this mean for those of us who want to be healthier in 2014? First and foremost, “eat clean”. Don’t grab the packaged juice drink, incorporate some nutritional powerhouses like kale, ginger and beets into your next meal; include some high protein and high calcium foods like greek yogurt, hemp seeds and almond milk throughout the day; and eat foods high in healthy omega 3 fatty acids like salmon, flax seeds and chia seeds. Kale: A delicious, low calorie, high fiber, leafy, green vegetable that is a good source of iron, calcium,vitamin K, vitamin A and is full of powerful antioxidants like carotenoids and flavonoids. Something this healthy should be eaten often. So, bake up some kale chips, use it as a base for your salad or saute it with your favorite recipe. Ginger: Studies have shown that ginger has anti-inflammatory properties, reduces exercise-induced muscle pain and menstrual cramps, and is widely recognized for its benefits for reducing nausea and upset stomach. Add some ginger to your green tea; mince, grate or chop it and add it to salad dressings, sauces or other recipes to incorporate more flavor. Beets: Extremely rich in antioxidants and anti-inflammatory compounds as well as high in fiber. They have been touted as having numerous anti-cancer benefits because of their nutritional profile. Grate raw beets and add to salads or soups, or boil and marinate them as a side dish. Greek yogurt: Excellent source of protein and calcium. Be aware, however, of the sugar content in the flavored options. For the healthiest option, eat plain, nonfat Greek yogurt of your choice and sweeten with a teaspoon of honey or blue agave or 1/2 cup of berries. Almond milk: Twice the calcium of dairy milk and is a good choice for those who are lactose intolerant or sensitive. Choose the unsweetened option which has 0g of sugar compared to 8g in a cup of skim milk with 1/3 of the calories. Be aware, however, that it is not a good source of protein so pair it with a high protein oatmeal or cereal to achieve optimal nutrition. Salmon: A delicious, high protein food that is considered a heart-healthy food. It is high in omega-3 fatty acids which has been shown to promote heart health. For those who are not fish lovers, there are other options listed below. Hemp seeds: One serving has 10g protein and is overflowing with Omega 3 fatty acids which help reduce inflammation and play a preventative role in reducing heart disease. And, if that’s not enough, they are a rich source of magnesium and phosphorous to support bone health. Add them to soups, salads, pasta dishes, or on top of pizza for a nutritious kick. Flax seeds: The omega 3s in flax can help lower LDL (bad cholesterol), trigylcerides and blood pressure. They are a good source of fiber to improve bowel function. Flax also has the benefits of lignans, phytoestrogens which have been clinically shown to help protect against hormone related cancers, such as breast, ovarian, prostate and uterine. Flax seeds can be added to any baked goods recipe such as muffins, cookies, bread, or pancakes. Also, try it in a meat loaf or sprinkle Carrington Farm’s roasted flax seeds onto a salad for a delicious crunch. 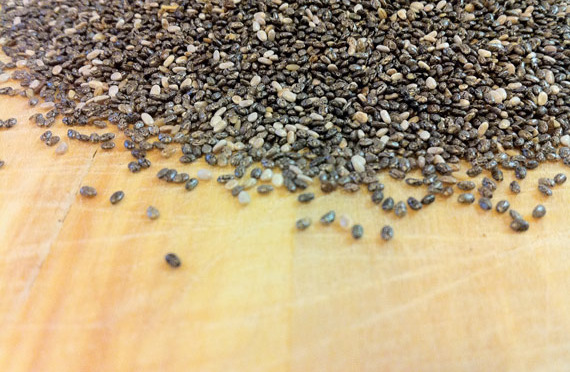 Chia seeds: These nutritious seeds are also high in Omega-3s and are very high in fiber. These seeds promote the feeling of fullness to help keep you satisfied and eat less. They contain high levels of antioxidants and are a good source of calcium and magnesium for bone health. Enjoy chia in smoothies, oatmeal or yogurt; add water to chia and it becomes a tasty gel-like drink or a possible egg substitute in recipes. Carrington Farms has uniquely combined the benefits of these nutritional powerhouses to achieve the ultimate in healthy eating. Try their flax chia blend and their flax hemp blend to get the most out of each of these super-foods in one serving. So, there they are…my favorite foods for health in 2014. Remember, the key to good health is to eat foods that are nutritionally dense and low in sugar. They are foods that are high in fiber, protein, heart-healthy omega 3s, and essential vitamins and minerals. They promote health through their anti-inflammatory properties and are rich in antioxidants. Incorporating just some of these foods into your daily diet will help you to nourish your body.